Yik Yak. Whisper. Secret. Now, Sarahah. In the world of anonymous apps, things never stay nice for long. Sarahah is hoping to change that. In mid-July, the buzzy new anonymous messaging app beat out mainstays like Snapchat and Facebook in the Apple App Store. Sarahah, which launched in Saudi Arabia in November 2016, invites members to leave anonymous messages on other users' profiles. But unlike its competitors, the messaging tool includes a reminder to "leave a constructive message :)" -- which the company hopes will encourage positivity. The app, with a name that means "honesty" in Arabic, was originally intended as a way for corporate employees to offer constructive feedback on their managers' performance — kind of like a suggestions box. But the built-in cue to play nice isn't entirely working. Sarahah is already embroiled in a debate about what anonymity helps on the Internet and what it hurts. "There's really nothing new about what this is doing," says David Ryan Polgar, digital citizenship expert and head of trust and safety for Friendbase, a virtual world for teens. "The larger point that we need to decide when designing these environments is pretty philosophical — at our core, 'how are people? If we leave them to their own devices, are they going to be toxic online or kind?'" Founder Zain al-Abidin Tawfiq says the app has taken several precautions against cyberbullying. For example, it has a feature that filters keywords and prevents certain messages from being sent. It's also added a tool to allow users to block accounts. "We're taking this as a serious issue, and we're focused on [building] new features," he says. "I don't want users to stray from the goal of Sarahah." As of August 2017, the app has more than 62 million users. Tawfiq told CNN Tech the app experienced massive growth among younger users after teens started posting Sarahah messages on Snapchat. "I told myself in November, 'You'll be satisfied with 1,000 messages' and then I'll call it a success," he said. "But now, we're getting close -- day by day -- to 1 billion messages sent." 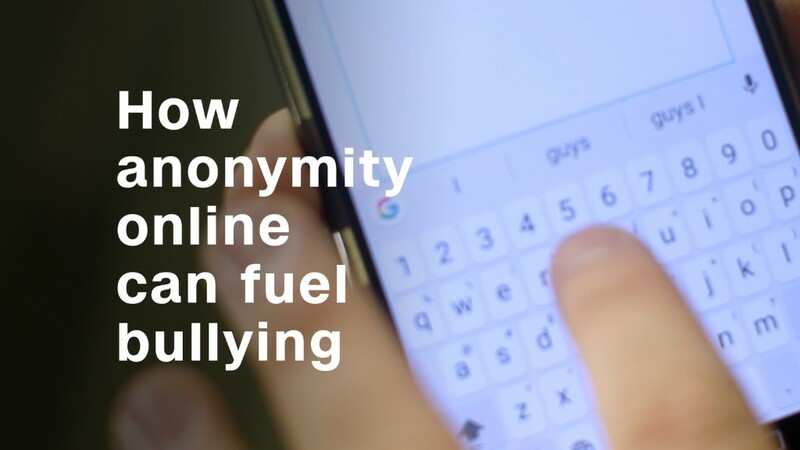 Other social media networks have struggled to combat cyberbullying. Under pressure from advocates and users, Twitter has pledged to crack down on harassment. It's also introduced new filter tools, better moderation and a human team reviewing reports of harassment. Meanwhile, anonymous apps advocates claim the platforms' anonymity allows for "authenticity"; critics say it opens the door for cyberbullies. But it's hardly the first app to go down this route. Here's a look at some of the apps that came before. Whisper -- one of the most well-known annoymous apps -- has a simple premise: Users post photos with captions divulging a "secret" for others to "heart," or Like. Some users post random thoughts and embarrassing stories from their childhood; others have shared stories of sexual assault or abuse. Although vague reports surfaced in 2014 questioning the app's security, Whisper CEO Michael Hayward told CNNMoney the following: "We've set the tone from the very beginning to be positive. We don't tolerate the bad stuff." Even as the wave of anonymous apps crests and crashes, Whisper persists thanks to the app's focus on comment moderation via both artificial intelligence tools and a human moderation team. In 2015, the company said it had more than 20 million active users, but this July, Whisper laid off 20 percent of its staff to cut costs. Whisper has raised over $61 million in funding, in addition to ad sale revenue. After School is perhaps the least known anonymous app due to its restricted user base: high school students only. The demographic is encouraged to post updates to their school's "board." But parents and teachers can't log on to regulate what's happening. The app, which debuted in 2014, was originally rated for "12+" in the Apple App Store. However, Apple requested After School update its rating to "17+" after two students posted gun threats. The app has since partnered with organizations like Crisis Text Line and Stopbulling.gov. When it comes to anonymity and digital identity, Jeff Collins -- vice president of the app -- says "nothing is black and white." "We have a very specific audience," he says. "We're not [about] college students, we're not [about] adults. We look at this as though we have a responsibility to monitor the feed, take things down and essentially curate. We want to keep things positive." According to After School, the app is in use in more than 85% of U.S. high schools. Ask.fm, which launched in June 2010, asks users to pose questions and leave anonymous comments. But a series of teen suicides in both the U.S. and the UK has brought attention to Ask.fm's lack of protection against harassment. In 2013, former British prime minister David Cameron called for a boycott of "irresponsible websites." In late 2016, Ask.fm announced a "rebranding" that positioned the app as a Q&A platform — one with more than 150 million active users today. Secret, which shot onto the scene in 2014 and quickly gained popularity, is among a handful of anonymous apps no longer available. Although Whisper connects users to a larger network of both strangers and friends, Secret's focus was on sharing with the people who know you. Users could divulge "secret" stories as text over photos. Its controversies were a lot like Whisper, too. In 2014, reports said Secret posts weren't entirely anonymous. The app rushed to fix the privacy error but failed to control another major issue: cyberbullying. Before the app shut down in 2015, tech blogs and anti-harassment groups criticized Secret, and a Brazilian court even ordered Apple and Google to remove the app from its app stores. Founder David Byttow acknowledged Secret's anonymity had been "the ultimate double-edged sword." In the footsteps of Secret came Yik Yak, the college and high school "virtual bulletin board" sensation. After launching in 2013, it was valued at $400 million. But after a series of high-profile incidents of online abuse — including one case at the University of Mary Washington that ended in murder — the app was continually scrutinized for encouraging malicious behavior. Long before the others, there was Formspring. Launched in 2009, it allowed users to anonymously post questions -- from "what's your favorite color?" to more salacious ones -- on people's profiles. (Ask.fm is often considered a Formspring copycat). After several teen suicides were linked to Formspring in 2013, the app was bought by Twoo, an online dating app with a troubled history of its own. Formspring shut down in 2013. Update: This article has been updated to add a comment from After School.